Elephant Seals doing some serious power lounging in Grytviken, South Georgia, Antarctica. Check this out for a bit of humor. Yesterday was one busy day. Not only did we have to open all the boxes we'd left behind to lighten our load for the cruise to Antarctica, we had to literally take out everything we own and repack it. Thousands of Albatross nesting Steeple Jason Island in the Falkland Islands. Then, we had to check the baggage weight limits for tomorrow's flights, weigh the bags and move things around as needed. As it turns out, we've made it all work but we will have to pay US $80 (ARS 1602) for our third extra bag. 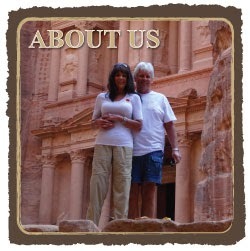 Each of our two main bags is within the 51 pound (23 kg) limit, give or take one kilo or so. An interesting small iceberg with glacial ice and snow. Then, we scanned all of our receipts, tossing the paper, from the past 20 days since we left Buenos Aires for the cruise including our cruise bill, transportation, and miscellaneous expenses. A Humpback Whale, one of many we spotted in Neko Harbor. From there, we paid our two-night Prodeo Hotel bill, in cash (trying to dispose of our remaining Argentine pesos), prepaid by credit card our taxi fare for today's ride to the airport at US $50 (ARS $1001) using a credit card. This left us with enough cash to tip the waiter for tonight's dinner (cash only for tips) at La Cabrera (we decided we needed to go one last time) and a balance of about US $14 (ARS) for the tip for the taxi driver and possibly a cup of coffee and tea at the airport. Perfect. It looks like the King Penguin on the left is nesting an egg. Or, could it be the chick is tucked underneath the parent's feathers? 3. Directions from Nelspruit/Mpumalanga airport to our holiday rental in Marloth Park. (It's been four years since we were there and we needed a refresher. 4. The address and instructions for getting into the property in Marloth Park when we arrive between 11:00 am and 12:00 pm. Rockhopper Penguins are so adorable. Gee...we don't like having to carry "zee papers" with us but in this case without data access, it made sense to us. We didn't want to be fumbling around with our laptops or phones trying to find what we need. During intermittent breaks from preparing yesterday's post, I ran upstairs to our room, did a little more sorting, folding and packing. When I returned Tom did the same. By 2:00 pm, we both went upstairs and weighed the bags using our portable scale. So far, so good. We missed a better shot of this whale's fluke. But, when whale watching, one takes what they can get. At that point I went online to attempt to prepay for the bags only to be given a notice see a pop-up announcing we can only check in at the counter at the airport nor could we prepay for our luggage (50% off to prepay) which again must be done at the counter. This has happened many times in the past. This is frustrating. Why should we have to pay double when we were unable to pay for baggage online. We'll certainly take this up with the rep when we get to the airport if they attempt to charge us the higher rates. This Caracara looks ready to find lunch. "Orcas, or killer whales, are the largest of the dolphins and one of the world's most powerful predators. They feast on marine mammals such as seals, sea lions, and even whales, employing teeth that can be four inches long. They are known to grab seals right off the ice. They also eat fish, squid, and seabirds." This morning we were up, showered and dressed early after a good night's sleep. By 8:00 am we were situated in the hotel lobby for a light breakfast of hard boiled eggs, ham and cheese. After all the whale watching trips we'd done on tours these past years, to finally see plenty in Antarctica was a dream come true. Who knows when I'll get to eat again? Airline food never works for me since the available options never fit my criteria. Oh, well, I'll be fine. We'll figure out something for dinner once we arrive in MP when we know we'll be too tired to grocery shop. We've received similar certificates on past cruises such as transiting the Panama Canal, etc. We scan these rather than carry them with us. 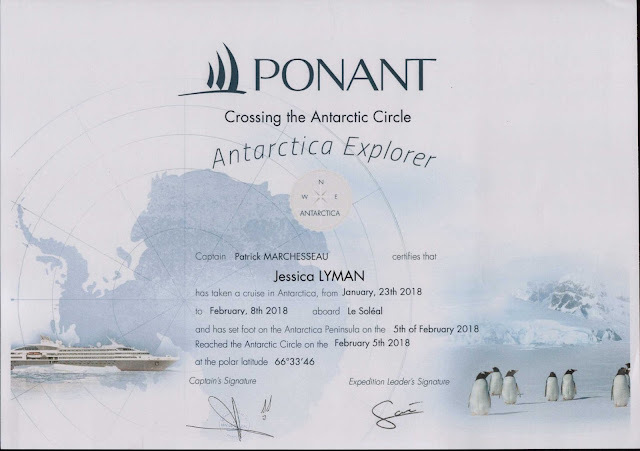 We each received an Antarctica Explorer Certificate. ﻿Sit tight, dear readers, we're about to go for quite a ride, this time with more experience and an even greater passion for the world around us. Hop on board! 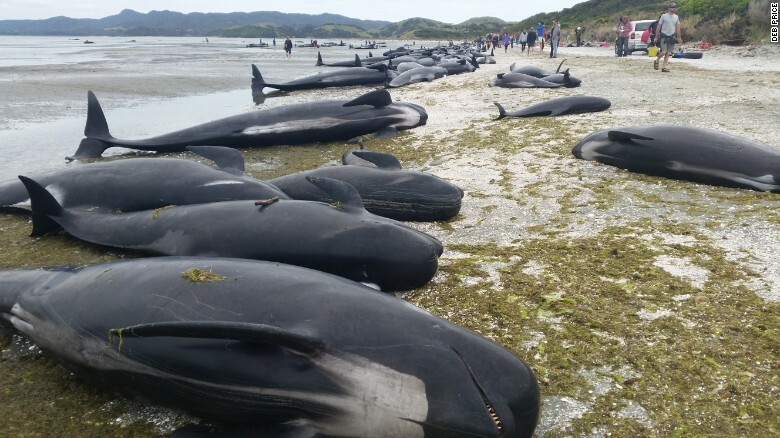 Hundreds of pilot whales were stranded on the beach in New Zealand. at this time last year (Not our photo). As we think about all the whales we saw in Antarctica this becomes all the more heart wrenching. For more details, please click here.